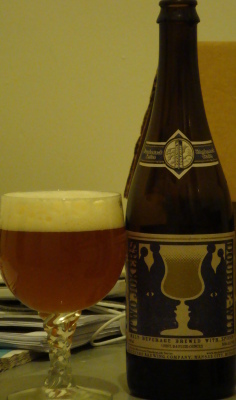 The latest release in the Smokestack Series from Boulevard Brewing Company in Kansas City is a Belgian-style wit (meaning “white” or, alternatively, “wheat”) brewed to American-style strength. Reflecting this dual nature they have called it Two Jokers Double-Wit. This beer is loaded with weird stuff, and I don’t mean simply the coriander and orange peel typical of witbiers. They also threw in lavender, grains of paradise, and cardamom. For good measure they fermented it with a lactic-acid producing bacteria in addition to the usual wit yeast. A huge pillowy head forms above the mildly hazy pale amber Two Jokers. The aroma is light, but much complexity is packed in. A swirl of spices is complimented by a delicate and refreshing acidic nose. Some fruit is noticeable (probably from the yeast) and a bit of wheat malt comes through. In contrast to the nose, the taste is unabashed. The spices play a not-quite-too-agressive role, with especially the coriander and grains of paradise lending their unique flavors. There is but a hint of alcohol that is quickly covered by the acidity. A light citric fruitiness, of oranges and lemons, rounds out the flavor. The body is just a bit heavy despite the refreshing effect of the lactic acid. The cornucopia of spices works wonders for the aroma but it might be a little too much on the taste. However, all in all a great wit.